Actor Allu Arjun’s upcoming film Naa Peru Surya is currently being shot at the Indo-Pak border and important scenes involving Allu Arjun are being canned. A video went viral on social media recently which had Allu Arjun playing a game of volleyball with the soldiers around, having a great time during the shoot. The film is slated to be released on May 4th, 2018 worldwide and this date was confirmed a day ago by the makers after a mutual understanding with the makers of Mahesh Babu’s Bharath Ane Nenu. The makers of Naa Peru Surya have now announced that a brand-new poster from Naa Peru Surya will be released on March 1st, 2018 which will have Allu Arjun in a never seen before look, much to the joy of fans. The makers have termed it as Poster Impact and confirmed this on social media. The temperatures at the shooting locations of Naa Peru Surya are said to be around -12 degrees and the cast and crew are doing their best to get the shots right under these extreme weather conditions. The makers, including Allu Arjun, wish to have a realistic feel to the visuals of the film and hence are shooting under such weather conditions. Allu Arjun is said to have gone through a special training for his role in the film and had a trainer from the US flown in to prepare for his role. The makers have confirmed that Naa Peru Surya will it the screens on May 4th, 2018 worldwide and will be a summer release. Naa Peru Surya will have Allu Arjun playing a soldier who has anger management issues and the stylish star will be seen sporting a rugged look in the film. 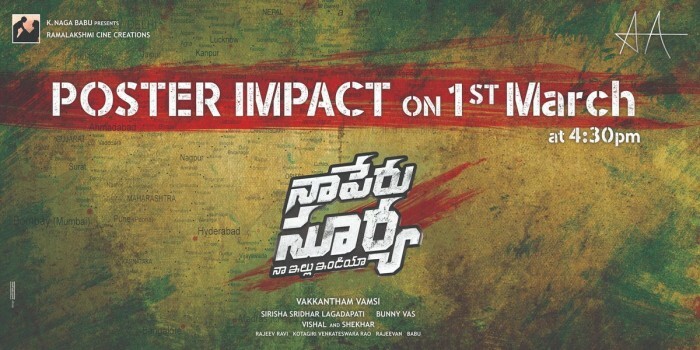 Directed by Vakkantham Vamsi, Naa Peru Surya will have music by Bollywood composer duo Vishal-Shekar and will be their second outing in Telugu cinema.